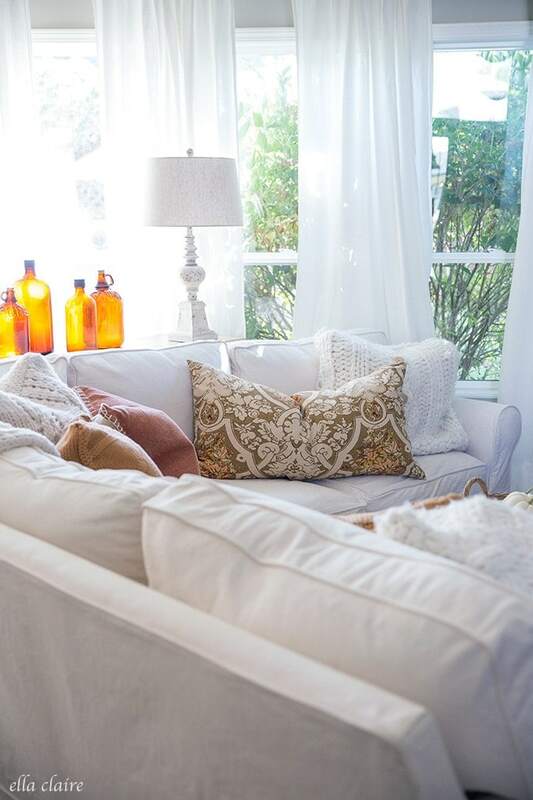 I added a few autumn touches to our family room this week with cozy pillows, amber glass, and a warm traditional fall color palette of burnt orange, nutmeg, and golden tones. As I watched the fall trends move toward non traditional hues this year, my heart just seemed to want the traditional colors even more. Call me a rebel. Call me nostalgic and set in my ways. 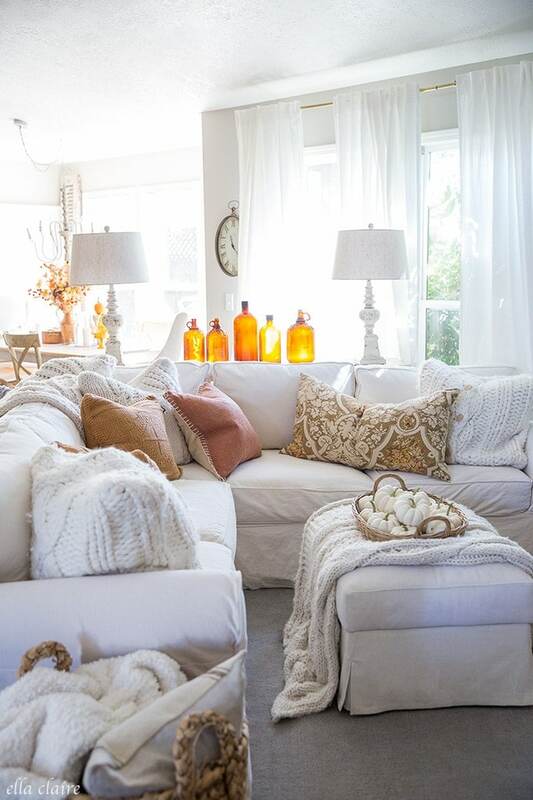 Maybe I am a little bit of both, but I just love how inviting and warm fall colors can be. 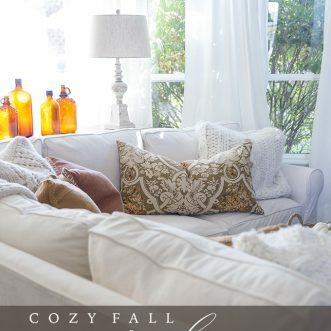 I am sharing 16 different cozy fall family rooms at the end of this post for our Seasons of Home tour and there really is a style for every taste. You will love the inspiration. As I was having some mommy quiet time a few weeks ago wandering up and down the aisles of our local antique mall, I stopped by my favorite booth- the one with great things that are always underpriced. On the shelf he had a bunch of amber glass bottles that caught my eye and I knew that I wanted them for my home for fall. I even knew the perfect spot for them on this little end table behind our couch where the sun would make them glow and sparkle throughout the day. 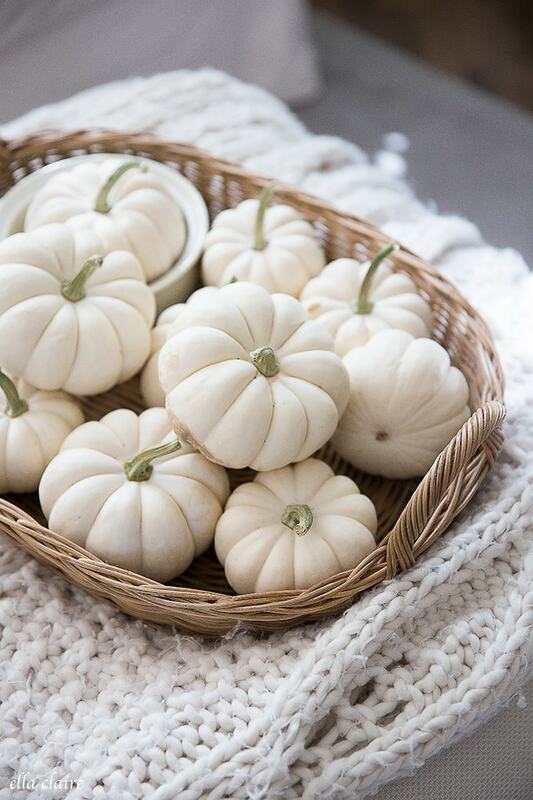 A couple of weeks ago, I also stopped by a local farm and bought a bunch of these beautiful little white pumpkins. Each of the kids get to have one for their rooms and I get to play with the rest. I put mine in this basket I bought on clearance in-store (here). 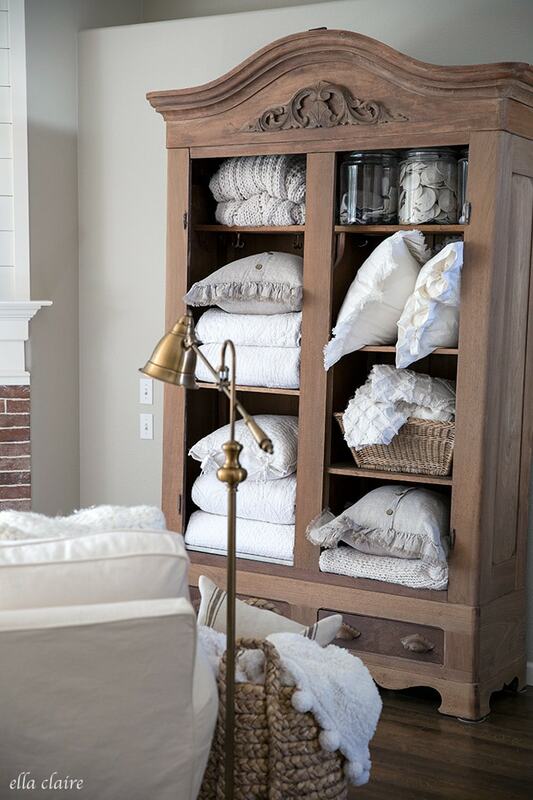 I added some cozy pillows, blankets and throws to my antique armoire. 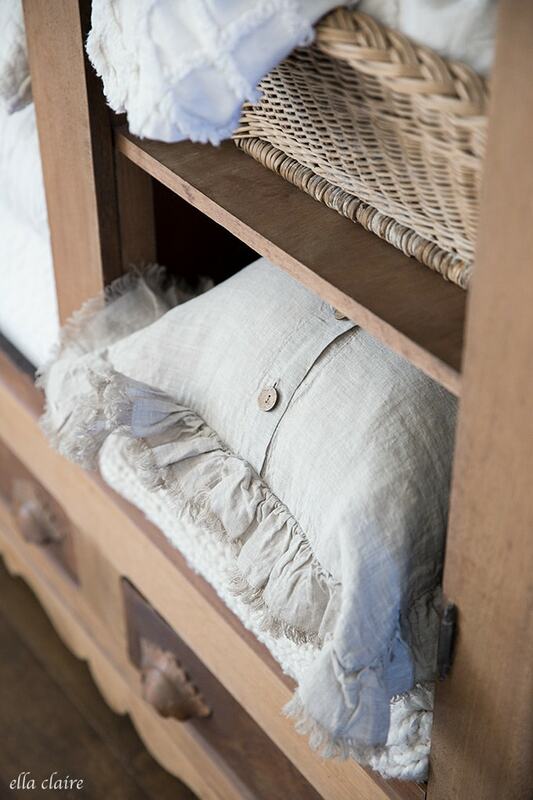 The quilts and throws are ones I have had for a long time, and I am so excited to have some of these beautiful linen pillows available in my shop in a couple of weeks when we open. I found the sweet basket at a little shop when we were on vacation on the Oregon coast. I have had the floral pillows for a couple years now and I have rotated them around the house each fall. 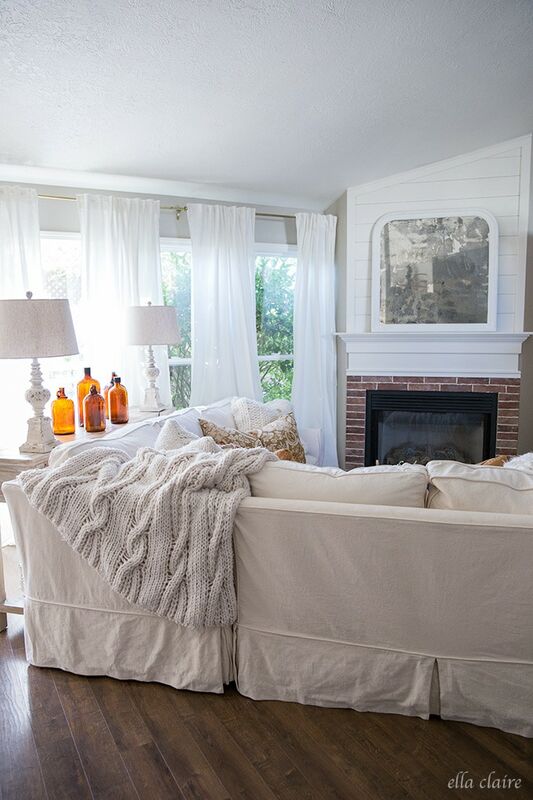 I found them on clearance at Pottery barn and they are really king shams. I keep telling myself that I am going to cut them down and make them into normal sized throw pillows, but I keep procrastinating. We’ll see if I ever do it. 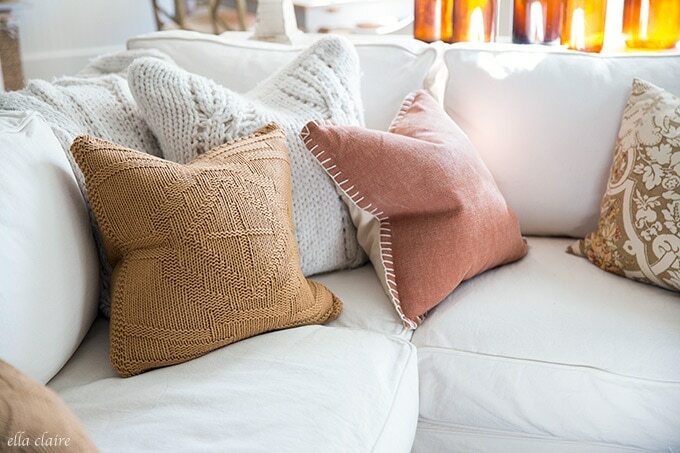 I paired them with these nutmeg and golden pillows I found at Homegoods along with some cozy creamy while pillows and throws I have had for a long time now. 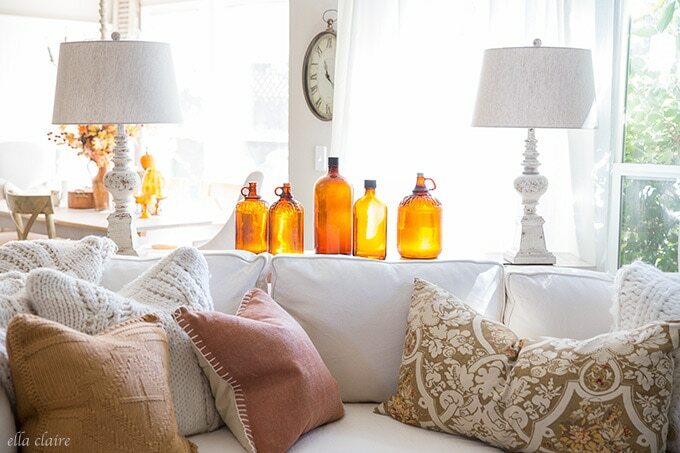 I love how the bottles are different colors depending on the time of the day and how much sun is coming in the windows. 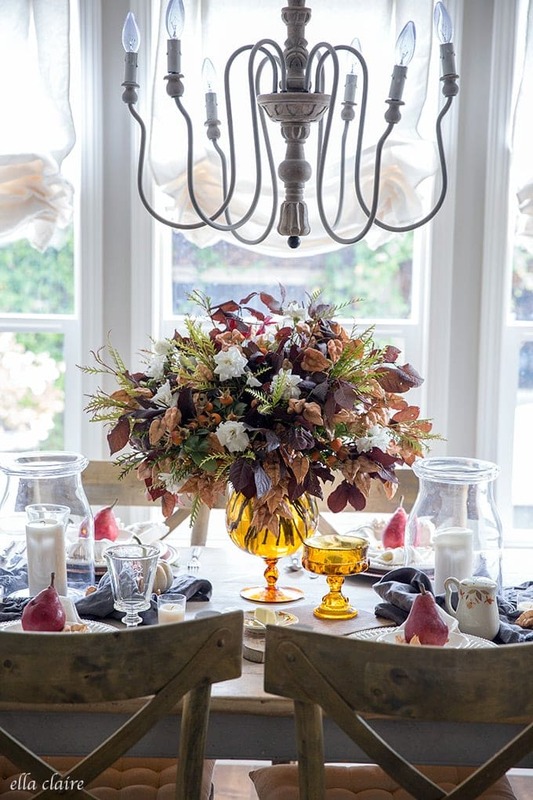 Do you like traditional fall colors? Or do you prefer to follow the trends? 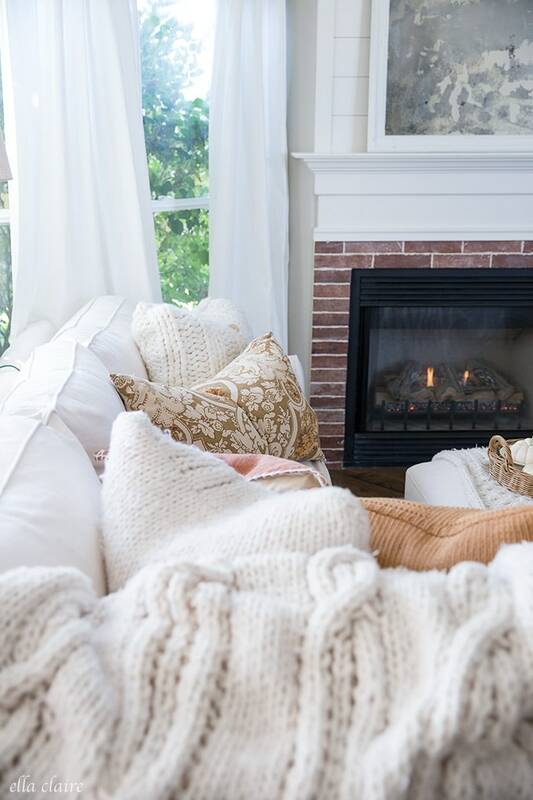 These 16 fall family rooms have so many beautiful ideas to make your home cozy for the season. I love that there is a style here for every taste and wouldn’t it be fun to mix a couple together? Beneath My Heart | Maison de Cinq | Shades of Blue Interiors | Nina Hendrick Design Co.
Sooo lovely. Those colors are amazing! Thank you again for having me on the tour Kristen- I’m so thrilled to be joining so much talent! I love that you kept traditional fall colors in your palette. 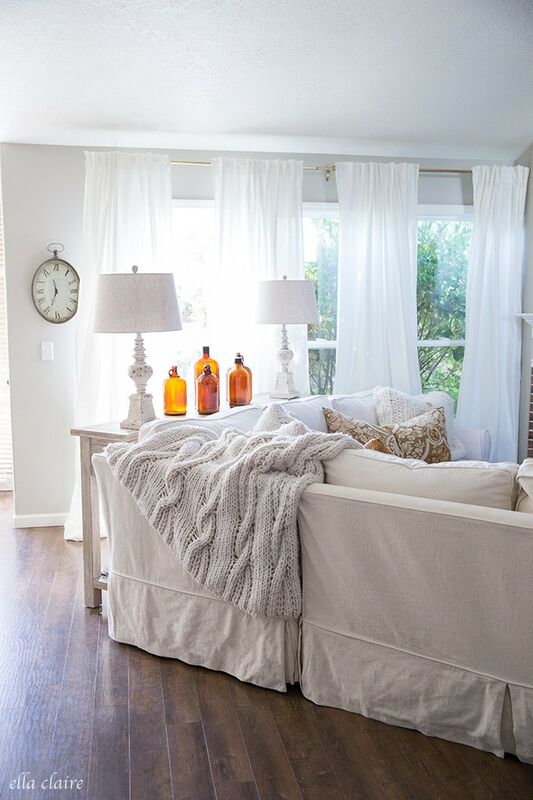 Those amber bottles really take center stage for the entire space. Thanks for sharing and inspiring!! I love everything!!! The gold bottles are so cool—yes, the light makes them glow. 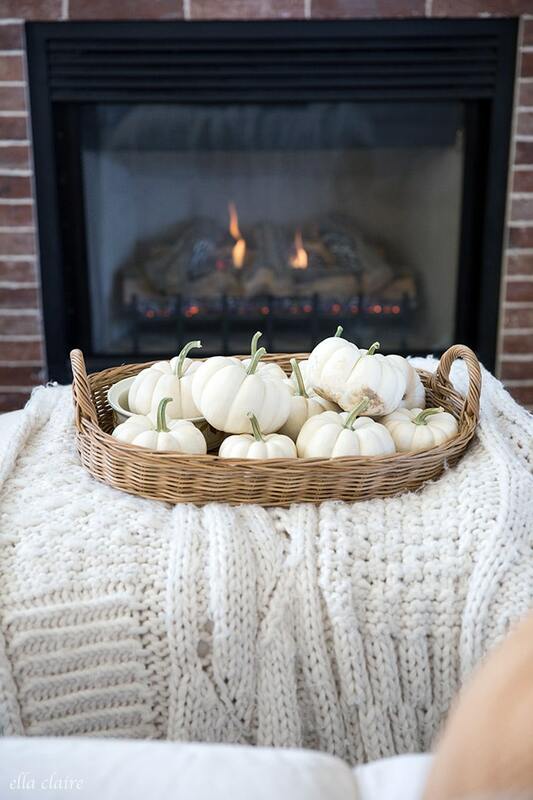 I also love how you corralled the white pumpkins in a basket. I think I have to redo mine! Just love you on Instagram and your blog. You are always a great source of inspiration and I just don’t know where you have time for all you do! I adore you Kristen and all of your lovely decorating. I stared at the armoire for like 3 minutes! Everything looks fall perfect. Absolutely GORGEOUS! I just LOVE your posts. These colors for Autumn…perfection. 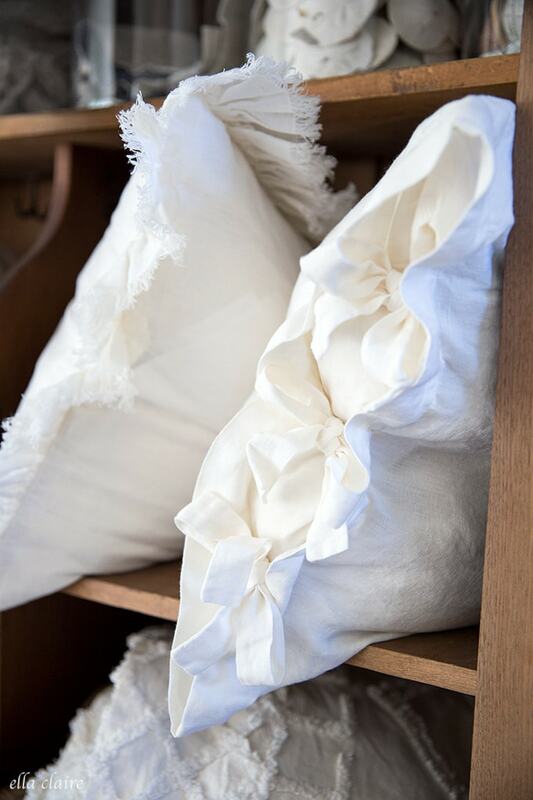 I wouldn’t cut the pillowcase down smaller either…looks perfect how you are using it!